Emily Elizabeth Dickinson (December 10, 1830 – May 15, 1886) was an American poet. Though virtually unknown in her lifetime, Dickinson has come to be regarded with Walt Whitman as one of the two great American poets of the 19th century. Her life has inspired numerous biographers and voluminous speculation; mostly about her sexuality, of which little is definitively known. Dickinson was born in Amherst in western Massachusetts to a prominent family. Her grandfather, Samuel Fowler Dickinson (1775–1838), was one of the founders of Amherst College, whose campus stands less than a mile from the family's home. Her father, Edward Dickinson (1803–1874), was a lawyer and treasurer for the college. He was also politically prominent, serving on the Massachusetts General Court from 1838 to 1842, the Massachusetts Senate from 1842 to 1843, and the U.S. House of Representatives (to which he was elected as a Whig candidate in 1852). His wife, and the poet's mother, was Emily Norcross Dickinson (1804–1882). She was quiet and chronically ill. William Austin Dickinson (1829–1895), usually known by his middle name, was her older brother. He later married her friend Susan Gilbert in 1856 and made his home next door to the house in which Emily lived most of her life. Their younger sister, Lavinia Norcross Dickinson (1833–1899), often known as "Vinnie," encouraged the posthumous editing and publication of her sister's poetry. Dickinson lived most of her life in the family's houses in Amherst. In 1840, Emily was educated at the nearby Amherst Academy, a former boys' school which had opened to female students just two years earlier. She studied English and classical literature, learning Latin and reading the Aeneid over several years, and was taught in other subjects including religion, history, mathematics, geology, and biology. At 17, Dickinson began attending Mary Lyon's Mount Holyoke Female Seminary (which would later become Mount Holyoke College) in South Hadley. When she again became ill in the spring, Austin was sent to bring her home after less than a year at the Seminary, and she did not return to the school. After that, she left home only for short trips to visit relatives in Boston, Cambridge, and Connecticut. For decades, popular wisdom portrayed Dickinson as an agoraphobic recluse. New scholarship suggests a much wider circle of influence. Dickinson's possible romantic and sexual adventures have been matters of great controversy among her biographers and critics. There is little evidence on which to base a conclusion about the objects of her affection, though Dickinson's passion is made clear by some of her poems and letters. Attention has focused especially on a group of letters addressed only to "Master", known as the Master letters, in which Dickinson appears to be writing to a male lover; neither the addressee of these letters, nor whether they were sent, has been established. Many biographers have been convinced Dickinson might have been romantically involved with the newspaper publisher Samuel Bowles, or a friend of her father's, Judge Otis Lord. Biographers have also found evidence that Dickinson may have had romantic attachments to women in her younger years, a hypothesis which has grown in popularity, despite scant and highly ambiguous evidence. After a claimed romance with Emily Fowler, circa 1850, some conjecture that Susan Gilbert 1851, a schoolteacher, was another possible love. All of Gilbert's replies were burnt by Dickinson's family after Dickinson's death, but Dickinson's letters to Gilbert have survived. The following is excerpted from a letter from Dickinson to Gilbert in late April 1852. I have thought of it all day, Susie, and I fear of but little else, and when I was gone to meeting it filled my mind so full, I could not find a chink to put the worthy pastor; when he said "Our Heavenly Father," I said "Oh Darling Sue"; when he read the 100th Psalm, I kept saying your precious letter all over to myself, and Susie, when they sang—it would have made you laugh to hear one little voice, piping to the departed. I made up words and kept singing how I loved you, and you had gone, while all the rest of the choir were singing Hallelujahs. I presume nobody heard me, because I sang so small, but it was a kind of a comfort to think I might put them out, singing of you. I a'nt there this afternoon, tho', because I am here, writing a little letter to my dear Sue, and I am very happy. I think of ten weeks—Dear One, and I think of love, and you, and my heart grows full and warm, and my breath stands still. The sun does'nt shine at all, but I can feel a sunshine stealing into my soul and making it all summer, and every thorn, a rose. And I pray that such summer's sun shine on my Absent One, and cause her bird to sing! Gilbert married Dickinson's brother Austin Dickinson in 1856. Emily reconciled with Gilbert in 1858 and resumed correspondence with her in a different tone, asking Gilbert to critique her poems, which at this time she began working harder at than ever. Dickinson died on May 15th, 1886. The cause of death was listed as Bright's disease (nephritis). Dickinson's poetry is often recognizable at a glance, and is unlike the work of any other poet. Her facility with ballad and hymn meter, her extensive use of dashes and unconventional capitalization in her manuscripts, and her idiosyncratic vocabulary and imagery combine to create a unique lyric style. During a religious revival that swept Western Massachusetts during the decades of 1840-50, Dickinson found her vocation as a poet. Most of her work is reflective of life's small moments and some larger issues in society. Over half of her poems were written during the years of the American Civil War. 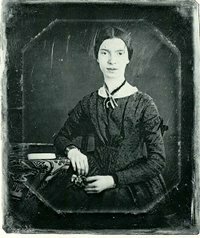 Many suggest that the Civil War gave some of the tense feeling in her poetry. Dickinson toyed briefly with the idea of having her poems published, even asking Thomas Wentworth Higginson, a literary critic and family friend, for advice. Higginson immediately realized the poet's talent, but when he tried to "improve" Dickinson's poems, adapting them to the more florid, romantic style popular at the time, Dickinson quickly lost interest in the project. Later readers would draw attention to the remaining problems in reading even Johnson's relatively unaltered typeset texts of Dickinson, claiming that Dickinson's treatment of her manuscripts suggested that their physical and graphic properties were important to the reading of her poems. Possibly meaningful distinctions could be drawn, they argued, among different lengths and angles of dash in the poems, and different arrangements of text on the page. Several volumes have attempted to render Dickinson's handwritten dashes using multiple typographic symbols of varying length and angle; even R.W. Franklin's 1998 variorum edition of the poems, which aimed to supplant Johnson's edition as the scholarly standard text, used typeset dashes of varying length to approximate the manuscripts' dashes more closely. Some scholars claimed that the poems should be studied by reading the manuscripts themselves.